You are currently browsing the tag archive for the ‘can’t finish’ tag. “Not squash!” Jim managed to interject. It was after 7 p.m. when we staggered in with our groceries. Then we had to clean the kitchen. Andrea called while I was cleaning – just as she set off the smoke alarm with her steak frites. She was opting for an easy (but delicious) dinner. Who starts ravioli – from scratch no less – at 7:30 on a Friday night? Well, me. First, I turned on the oven to 350°F. I cut the top off of a head of garlic, drizzled with some olive oil, and wrapped it in tinfoil. Then I roasted it until it was soft (about 40 minutes; I took it out just as the pasta dough was ready). I also chopped up about ½ C pecans and toasted those until slightly browned (okay, until 1 second before burnt – I forgot about them as usual). I started out with Mario’s recipe for pasta dough: 3 1/2 C all-purpose flour and 5 large eggs. Make a well in the flour, use a fork to mix the eggs in and then knead. My eggs promptly tried to escape and run across the counter. It took two of us to wrestle those suckers into submission. Guess they make the eggs bigger in Marioland because I had a dry, gross mess on my cutting board. I added another egg. 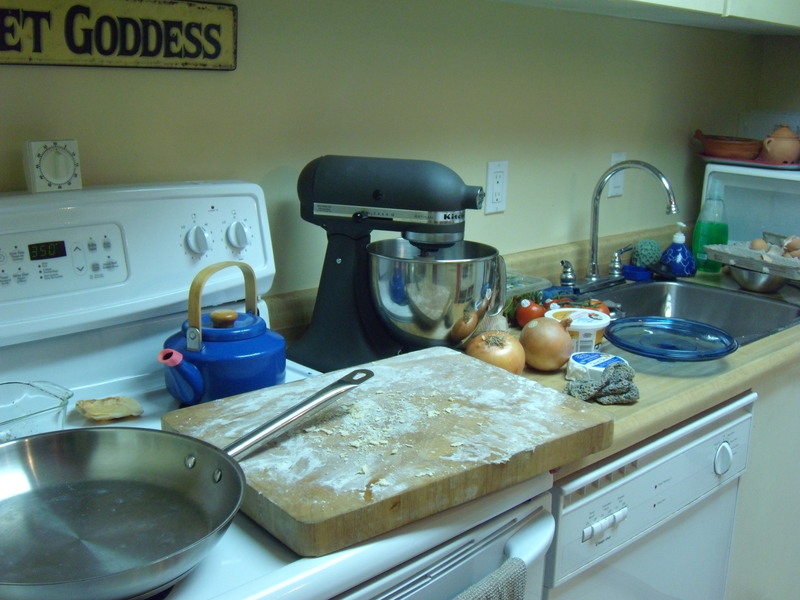 Once I had a reasonably cohesive mass on my cutting board, I asked (ordered) Jim to throw the rest of the slightly eggy flour away so I could knead the dough. He threw away more than a cup. Next time, I’m starting with 2 1/2 C of flour and adding in what I need. I then kneaded the hell out of the very firm dough for 10 minutes. At about minute 8 I determined that my dough was drier than Mario’s suggested “springy and slightly sticky.” I drizzled about a tsp of olive oil on the counter and kneaded that in too. It was the perfect solution, if I do say so myself. My dough transformed from slightly dry to silky smooth. It was still very firm, though. And not sticky at all. I forgot to pick up saran so I put my dough under an inverted bowl for half an hour. Then we swept the flour, laughed at my flour-covered yoga pants, and tried to scrape dried flour and egg off of my wooden cutting board. Despite my suggestion, he did not add some grated parmesan. I threw the toasted pecans into the food processer and ground to a fine meal. Then I squeezed in the garlic and blended well. Then I chopped an entire round of Comox Brie into chunks, and processed that in with a little salt and pepper and half a tsp of olive oil. I didn’t bother to cut away the rind. 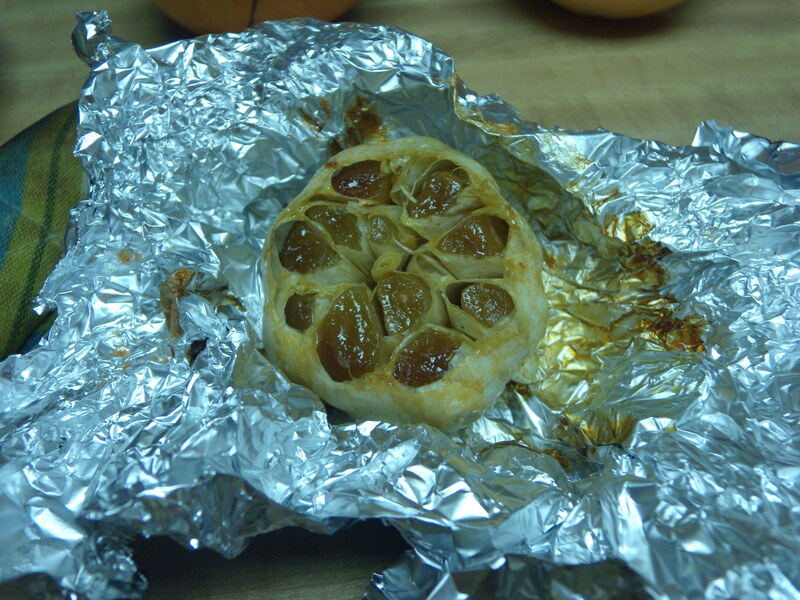 Far from being impossibly gooey, it had the texture of, well, sausage. 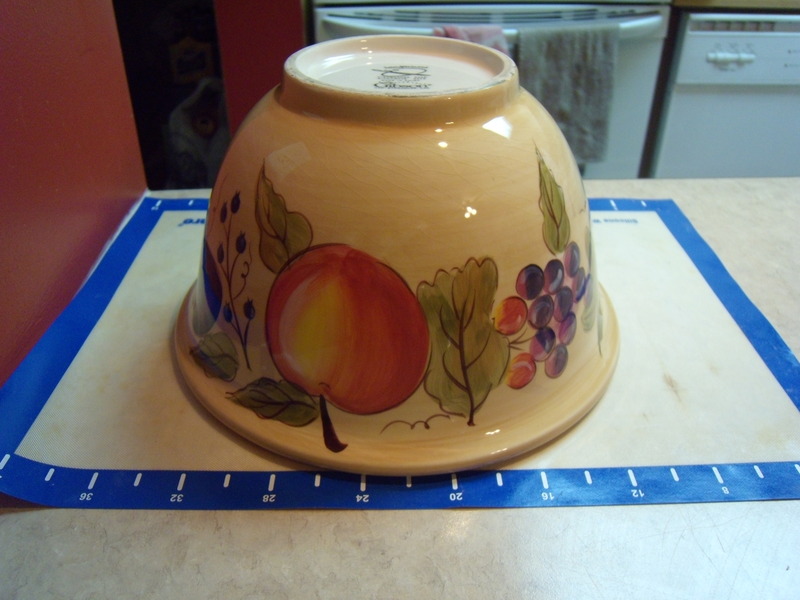 Perfect for stuffing pasta. I stopped at Ming Wo twice yesterday. Once on the way to work. They weren’t open yet (despite advertising that they open at 9:00 a.m.). Once on the way home (we were 10 minutes too late). Thus, no crimping pastry / pasta wheel. Oh well, a fork would have to do. 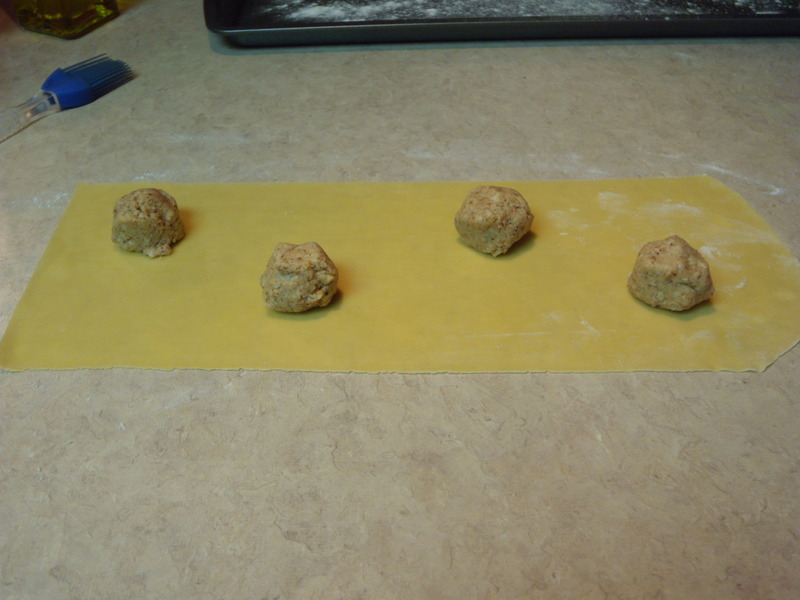 We rolled out our pasta to the thinnest setting. Then we laid it on the counter and filled it. I actually prefer hand-shaped ravioli to ravioli in a press. 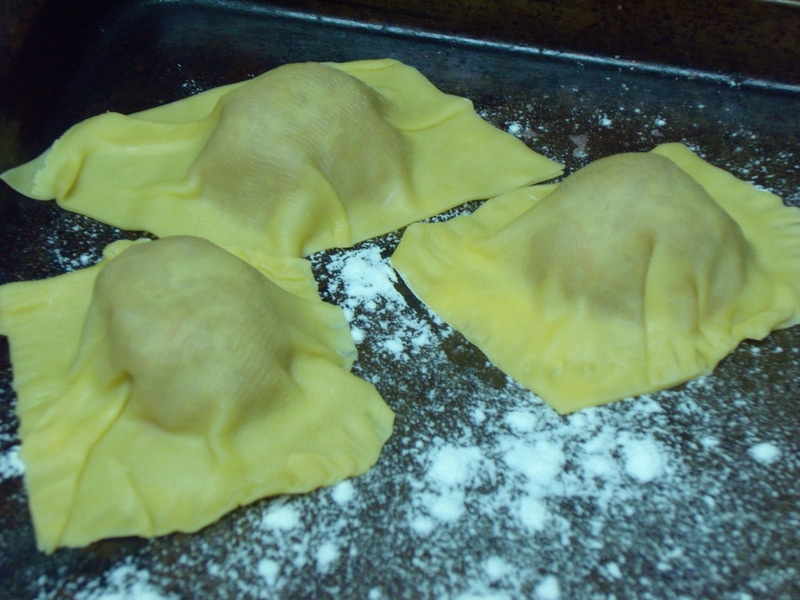 You can do a much bigger ravioli – like a poofy ravioli cloud – instead of just a little ravioli pillow. It’s all about preference. Make sure you crimp the edges with a fork if you don’t have a wheel. 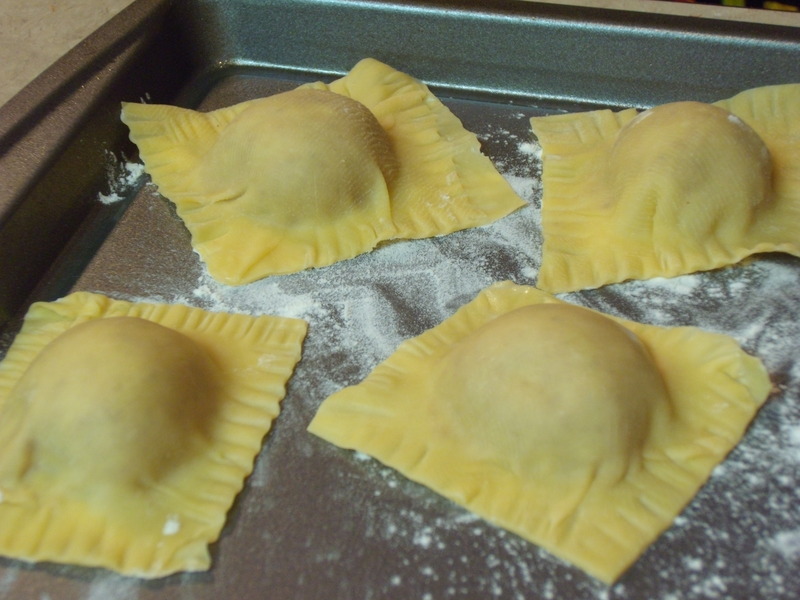 Allow the ravioli to dry a bit, uncovered, while the pasta water (liberally salted) boils. 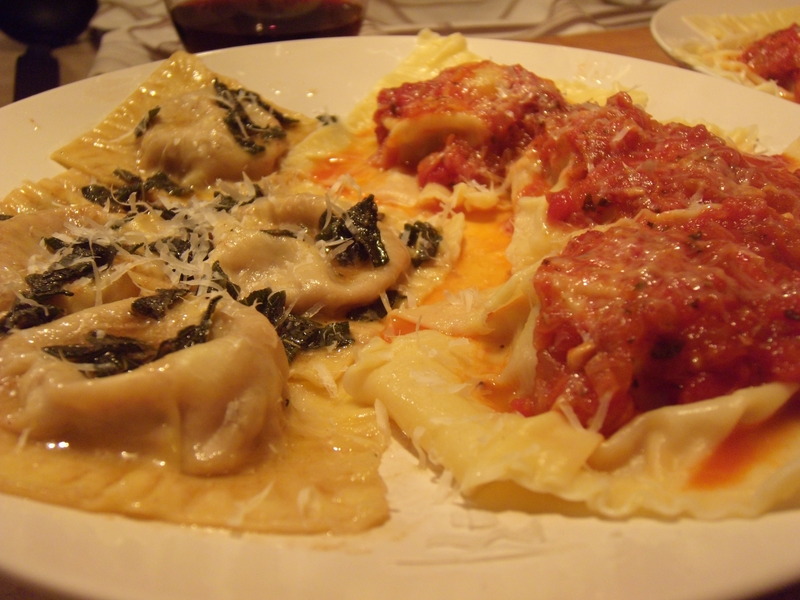 Our raviolis were so darned big, we “only” cooked four of each kind, each. That was way too many. Before I dumped the ravioli in, I put about 1/4 C butter in my big-assed saucepan and began browning it. 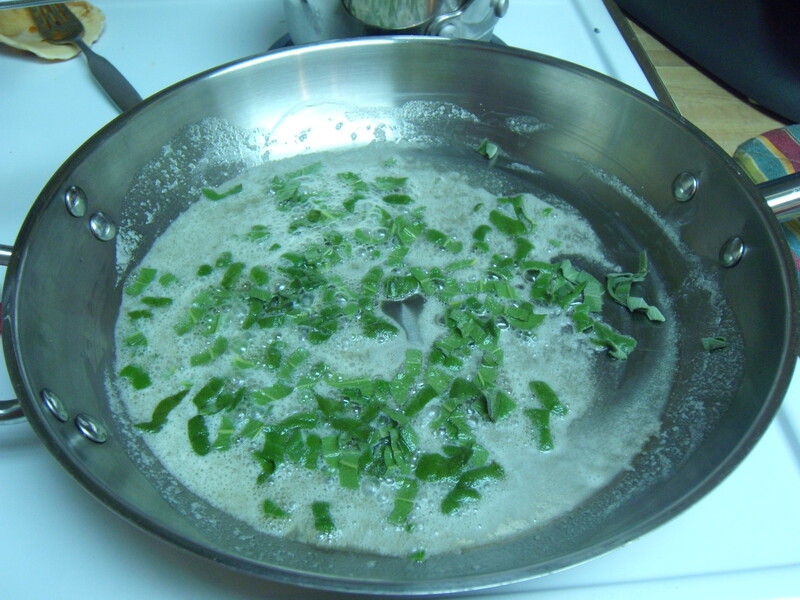 Then I tossed in about 2 tsp sliced fresh sage. Jim heated up some home-made tomato sauce (that’s a recipe of Mario’s I’d feel guilty about sharing. Go buy his recipe book). Jim's. A little more "rustic", non? We cooked the brie-stuffed pasta until it floated, and the turkey-stuffed pasta for about 4 minutes (the meat was raw after all). I scooped a little pasta water into the bubbling brown butter, then lovingly placed the brie clouds into it. Then plated, sprinkling liberally with parmesan. 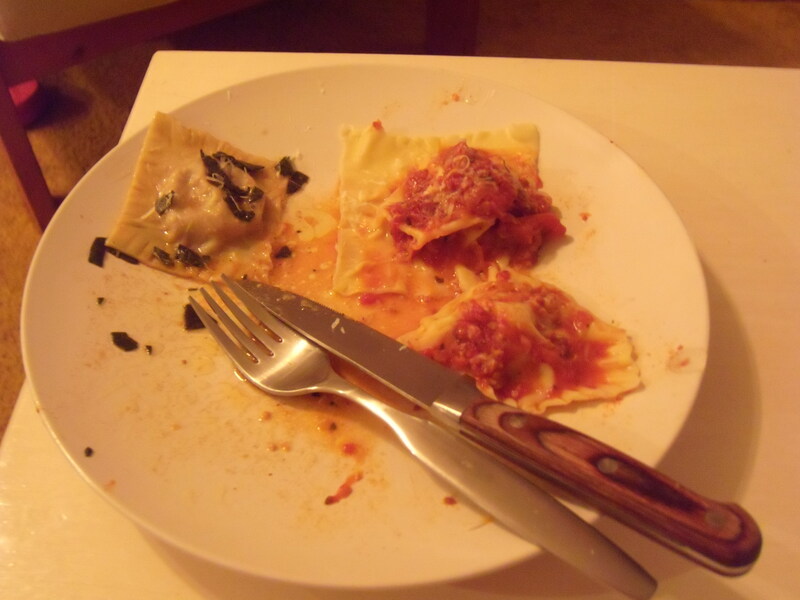 Et voila: roasted garlic and brie ravioli with brown butter sage sauce, and turkey “sausage” ravioli with tomato sauce. I hate to say it (so did Jim, but he admitted it), the brie ravioli won hands down. It was soooo rich and decadent, I could die. The turkey “sausage” ravioli was excellent, in a hearty, stick-to-your ribs kind of way. More of a Tuesday night dinner than a Friday. Did I mention we plated at 10:45 p.m.? Needless to say, I woke up this morning to a trashed kitchen.